That crazy spindle project I had left over from the Tour is done. It was the project that came from the batt I had made ages ago and then plied with three shades of blue merino. It's certainly on the wonky side but it's fun. You can't see it but it even has sparkle. I am anxious to swatch it to see what it would be good for. I'm thinking some fun mitts. 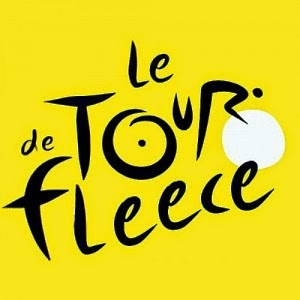 Here's the new grand total from this year's TdF and there is still more of almost all of this on all three wheels. 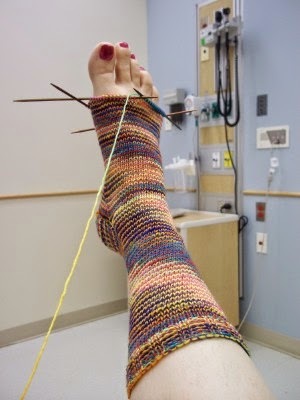 I wish I could knit faster. The next morning I made it to the point where I got to wind it all on all by myself. That is a big deal because normally you need two people but no one is ever around when you need them. With this method you separate the warp into bunches and then slowly wind and yank, wind and yank, and then wind and yank some more. I was terrified. I am happy to say that it all worked like a charm. It's all perfectly tied on with beautiful tension and ready for weaving. I just need to wait for my weft to show up in the mail. I'm out of the 8/2 cotton. As usual, I underestimated how much I needed. Let me acknowledge who made all this fun possible. There are tons of little tricks in this lesson that make things go very smoothly. I'm not so sure if it was without worry as the title promises but this technique works wonders with thin sticky cotton that needs to stay in a color pattern. I had the DVD running alongside me for two straight days and it was like someone was holding my hand the whole time. I also owe a lot of credit to my orange friend here. Sitting for hours at a loom is hard on the posterior but Mr. Bouncy sure helped. My new warping DVD shows you how to thread the reed while it is sitting on a table rather than when it is on the loom. After my last threading disaster, this idea seemed like a good one. Of course there were some obstacles to overcome. First I had to figure out how to prop up the reed. I used my napkin holder which worked fine for a while. Then The Mister came up with these little clamps that have legs on them. They were brilliant. They are mine now. The reason for doing it this way is to keep all that sticky cotton from tangling. On the table you can spread it out and weight it down. ...until I went to put it on the loom. I had tied my choke too far from the front beam and I ended up with an unholy mess in front of the reed. Threading the heddles was a nightmare but with The Mister's help I got the nasty tangles out and went to bed. By this time it was almost midnight and I was worn out. Weaving is hard work. I started this autumnal cardigan last fall and when winter came I put it away. I'm weird like that. I can't work on projects that are distinctly seasonal when the season is over. Picking it back up has been a nightmare. It is a very simple pattern but I can't wrap my brain around it as you can see by all my pattern rewrites. Being cable challenged doesn't help. For the life of me I can't ever figure out which way they are supposed to go without a cheat sheet. Making it even worse is that I am trying to learn to cable without a cable needle at the same time. I picked up a giant bag of this yarn from Knit Pick's orange and black sale last year and it's my first real go round with their signature WOTA worsted weight. If I didn't have to keep ripping or dropping the cables back I would probably be enjoying it more because it's a very pretty color. You know I had to take off all that warp and rearrange it. It wasn't that hard. I split up the red so that now I have a little on each end and a little in the middle. I also saved enough for a little stripe in the weft. Now I need to go rewatch my DVD to see how I proceed from here. From now on, it gets really scary. If you get a lot of wraps per inch it just means you have a skinny yarn. 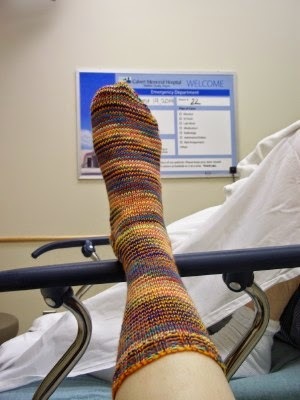 Skinny yarns make nice socks and lace shawls but they can also make nice garments if you don't mind knitting something that will have lots of little stitches. I don't, so I will. Got that? 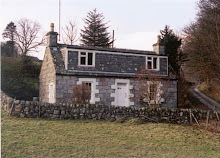 My lonely little Shetland ball needs a project. I want it to be a vest for this winter but look at how many wraps I am getting to an inch. It's not really winter garment weight so finding a pattern hasn't been easy. 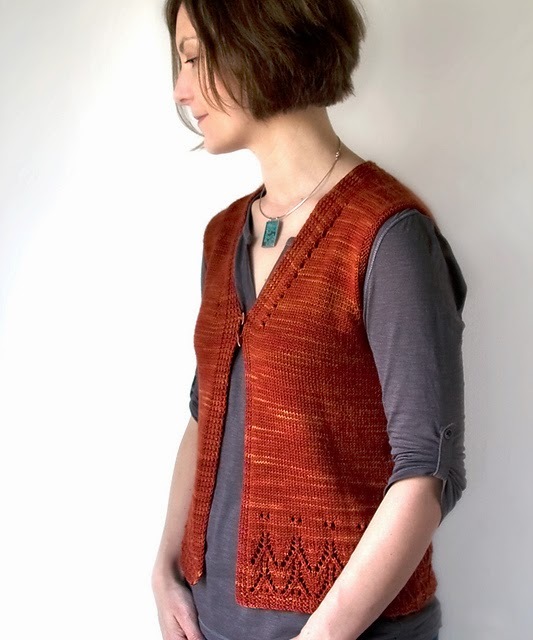 At the moment, I'm leaning toward Galiano by Megan Goodacre but I'm not sure if it's the vest or the haircut I like. I've still got two bobbins to ply and this much left to spin so I'm not in too much of a hurry but in order to get my spinning mojo back with this project I need to have a reason to do it. She was nominated by me to take the ALS Ice Bucket Challenge after I was nominated by a childhood friend I haven't seen in years. Lesson Number One: Don't let a man prepare the buckets of ice water. The Mister's concoction was brutal. This was nothing to him. He does the Polar Bear Plunge into the bay in January. The real reason we needed Sister to join us is that she has a smartphone that could upload our little adventure to Facebook. I have to confess: The Mister and I don't have one. Ours still flip. ...it was so incredibly shocking to the system that instead I let loose with a naughty word and the serious threat of throwing up. It was that bad-but in a good way and for a good cause. I thought that I finally had enough of those blue striped singles to ply with the purple and yellow singles from the TdF. ...I was wrong. I still have lots of the original singles leftover. So now I'm back to spinning more singles even though I don't have anymore of the medium blue fiber. By the looks of the 2 ply, it really doesn't matter. As usual, it's not turning out to look anything like I expected but with this particular project, that's no problem whatsoever. I went outside to take photos of the newly finished purple border but it took me a while to figure out what side was up. It wasn't this side. That's right. The white horses (?) in the middle need to be on their feet and not on their backs. I'm still not sure where I'm going with this crazy looking thing but I'm having a lot of fun getting there. After watching my new DVD on warping methods, I decided to put aside the dishtowel kit and raid the stash. I wanted to play with all the new techniques I had learned but I didn't want to ruin my expensive kit materials. Halfway through the new warp, I realized that I was going to run out before I could come up with a pattern that made sense. Even so, I went ahead and finished to see how bad it could be. It's bad. I don't think I can live with those red stripes on one side of the towel and not on the other. I'm pretty sure the next time I post about this project you will see that I unwound it (I'm getting good a that) and tried another configuration. Daughter was off traveling in South Carolina last week and as usual, scouted out an interesting yarn shop in order to bring me back a surprise for watching her kitties. 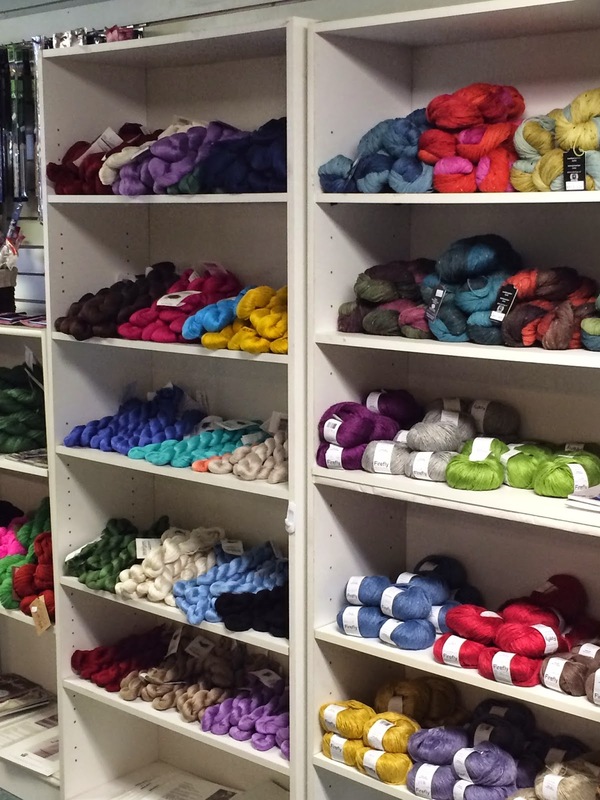 It's three skeins of lovely sock yarn hand picked with help from the staff of The Courtyard in Hilton Head. It's a yarn/bookstore and Daughter enjoyed her visit very much. I shamelessly stole a photo from their website. You can see more here. 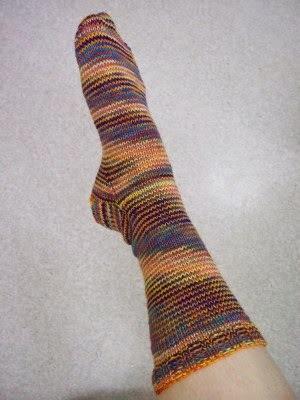 The good news is that the first of my Grateful Dyed socks is done. The bad news is that the reason it's done is because yesterday, I spent an entire day and most of a night doing this-again. I took Daddio to his doctor to get his pre-op clearance and along the way the nasty hip decided to dislocate once again. This is the second time in five days and this makes a grand total of five times in a month. 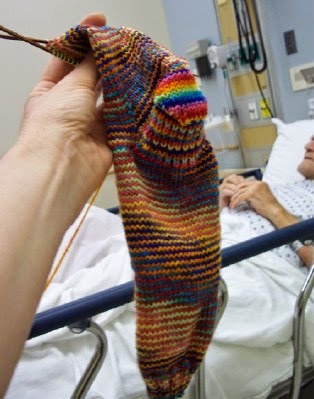 I was knitting fast and furious as we waited for the hospital to get an open operating room to put it all back in place so we could be on our not so merry way. I don't have any good news about the hip. 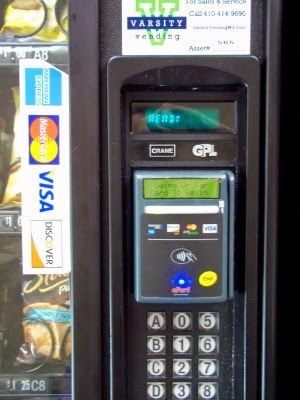 It's all bad but I did discover that the hospital vending machines now take credit cards. Now that's something to get excited about.